Objective: The purpose of this study was to validate a Chinese version of the modified Standardized Swallowing Assessment (SSA) instrument used by nurses in stroke patients with dysphagia and explore the feasibility of the simplified instrument. Materials and Methods: This study involved a cross-sectional design. Nurses independently applied the modified SSA to 127 patients with stroke before a complete dysphagia evaluation conducted by a speech–language pathologist. Factor analysis of eight dysphagia variables in the modified SSA was performed to evaluate construct validity. The accuracy of the screening instrument was assessed through receiver operating characteristic (ROC) analysis. Results: The comprehensive swallowing assessment revealed that 49.6% of the stroke patients had dysphagia. The modified SSA had an acceptable internal consistency coefficient. The inter-rater agreement between nurses using the modified SSA showed a Kappa coefficient of 0.509. All items had a communality loading of >0.5, and two factors accounted for 73.89% of the response variance. The area under the ROC curve was 0.79 (95% confidence interval: 0.71–0.87). The sensitivity and specificity derived for dysphagia detection were satisfactory according to the results obtained from the original 8-item and simplified 6-item scales (sensitivities = 82.50% and 81.00% and specificities = 59.40% and 64.10%, respectively; accuracy = 70.87% and 72.44%, respectively). Conclusion: This preliminary study suggests that the modified SSA is a potentially reliable and valid nurse-administered screening instrument for dysphagia detection in patients with stroke. Cerebral vascular accident was the fourth leading cause of death in 2016 in Taiwan. Dysphagia occurs in 22%–65% of patients with acute stroke,. It leads to aspiration pneumonia in 37% of these patients, which can considerably increase the length of hospital stay and medical costs, and may lead to patient mortality,,. In addition, dysphagia is associated with nutritional compromise and dehydration and diminishes quality of life. Hinchey et al. revealed that screening instruments can reduce the incidence of subsequent pneumonia in patients with stroke. Early assessment and management of dysphagia can significantly reduce the rate of pneumonia and improve the overall outcome after stroke. Sørensen et al. suggested that dysphagia screening and intensified oral hygiene reduce the incidence of pneumonia after stroke. The Joint Commission on Accreditation of Healthcare Organizations recommends that patients with ischemic or hemorrhagic stroke undergo an evidence-based, hospital-approved bedside testing procedure before oral administration of any food, fluids, or medications. Dysphagia screening instruments have been developed and used by various health professionals. Videofluoroscopic swallowing studies (VFSSs) and fiberoptic endoscopic evaluation of swallowing (FEES) are conducted by speech–language pathologists (SLPs). These invasive methods afford dynamic imaging of swallowing function. However, these methods cannot be repeatedly performed because they require special equipment and skilled personnel. Although SLPs have assumed a leadership role in dysphagia management in most Western countries, speech pathology services in hospital settings in Asian countries, such as Taiwan, are lacking. Furthermore, nurses provide 24-h care and are most often present at the bedside, particularly during administration of meals and medications. They play a crucial role in the identification, management, and prevention of dysphagia-related complications. Nurse-mediated dysphagia screening does not replace assessments by other health professionals; instead, it enhances care provision to patients at risk by enabling early recognition and intervention. Nurses should be trained to detect signs and symptoms of dysphagia and be aware of signs indicating a risk of dysphagia or aspiration in patients. Reliable assessment results can be achieved with minimal training to ensure that the entire process of training and implementation is not cumbersome. However, a universal, reliable nurse-administered dysphasia screening instrument for patients has yet to be established in Taiwan. Jaeschke et al. suggested that screening instruments should provide a true measure of a patient's degree of risk and sensitively detect the presence of risk. Several studies have reported psychometric data on dysphasia screening instruments,,,,,,,,,. The following seven tools could be used by nurses: the Standardized Swallowing Assessment (SSA),, Massey Bedside Swallowing Screen, Acute Stroke Dysphagia Screen, Yale Swallow Protocol, Dysphagia Screening Tool,, Korean version of the SSA, and the Nursing Dysphagia Screening Tool. The sensitivity and specificity of screening tests range from 29% to 100% and 65% to 100%, respectively. The psychometric properties and feasibility of the SSA were higher than those of other screening tools that can be administered by nurses to detect dysphagia. The SSA comprises three sections and is designed to terminate if a problem is encountered. The first section checks whether the patient is physically capable of screening; sections 2 and 3 comprise the main screening test. Volitional cough, saliva control, oromotor dexterity, respiratory compromise, and phonation are evaluated first; if no problems are elicited, the ability to swallow teaspoonful of water is observed,. Perry's study proposed that not all components of the SSA tool are required; analysis suggested elimination of three variables, but further exploration is warranted. At our medical center, we currently use a modified SSA instrument for dysphagia detection in patients with stroke. However, the reliability and validity of the instrument have yet to be established. Therefore, the present study was conducted to evaluate the measurement parameters of the screening instrument, including its reliability, validity, sensitivity, and specificity, for the detection of dysphagia in patients with stroke. We further explored the feasibility of a simplified screening instrument for assessing dysphagia. We enrolled 127 consecutive patients with acute stroke who were admitted to the neurology unit at a hospital in Taiwan between October 2013 and December 2015. All patients satisfied the study's inclusion–exclusion criteria. The inclusion criteria were a diagnosis of stroke, a clinical diagnosis from a neurologist, and radiographic (computed tomography or magnetic resonance imaging) confirmation of stroke. The exclusion criteria were a history of head/neck surgery, trauma, or brain tumor that could influence swallowing abilities and any other concomitant neurologic disorders that could influence oropharyngeal swallowing abilities. This study involved a cross-sectional design and was conducted in two phases. In the first phase, we established the content validity of the existing nurse-administered swallowing screening instrument in patients with stroke, modified the instrument, and examined the instrument's item homogeneity and nurses' inter-rater reliability (IRR). In the second phase, stroke patients were screened by nurses within 24 h of admission using the Chinese version of the modified SSA instrument, and then, their swallowing abilities were assessed by an SLP. Currently, Taiwan does not have a set of screening criteria that nurses can use to examine patients' swallowing abilities. Nevertheless, screening methods that involve direct assessment of liquid swallowing can increase the risk of pulmonary aspiration. Therefore, our research institution avoids direct use of water swallowing as the first step in screening; instead, it adopted and modified the SSA proposed by Perry, and received permission from Perry to use this instrument for this study. Before the screening test, examiners must ensure that patients are awake and alert or responsive to speech and are maintained in an upright position. The modified SSA is divided into two parts. Part I comprises five oromotor examinations, and Part II involves a water-swallowing test. In Part I, patients must voluntarily cough, control saliva, lick the top and bottom lips, and breathe freely and cannot have a wet or hoarse voice. In Part II, patients are first given 1 mL of water, which is considered a safe swallow for patients with acute stroke in our clinical setting. Problems are identified if no attempts are made to swallow or water leaks straight out of the mouth, if coughing, choking, or breathlessness is observed, or if a wet/gurgly voice develops. In the absence of any problems, the process is repeated with second and third tests with 1 mL of water. Gradually, increasing volumes ranging from 1 to 10 mL sequential swallowing is used based on the patient's tolerance. If no problems are evident, half a glass of water (75 mL) is administered. The screening instrument is a pass versus fail procedure performed by nurses to identify individuals who require a comprehensive assessment of swallowing function by the SLP. This study was performed in accordance with the principles of the 1975 Declaration of Helsinki and approved by the Hospital Ethical Committee (IRB106-12-B). Before enrollment in the study, all patients were provided with detailed information about the investigation. The data were analyzed and are presented as means, standard deviations (SDs), and percentages. Subsequently, a Chi-square test was conducted to determine the correlation between two categorical variables, and an independent t-test was used to compare differences between continuous variables in stroke patients with and without dysphagia. To confirm the validity of the instrument, the Kuder–Richardson 20 (KR-20) and Kappa coefficients were used to measure internal consistency and the nurses' IRR, respectively. Content validity was determined using the scale-level content validity index (S-CVI) from the rating results by four content experts, and exploratory factor analysis was performed to test construct validity. The results of the factor analysis were considered and reviewed during item omission and simplification. A receiver operating characteristic (ROC) curve was used to analyze the optimal cutoff points for scale scores under different numbers of instrument items, and the area under the ROC curve was calculated to determine the discrimination ability of the ROC curve. 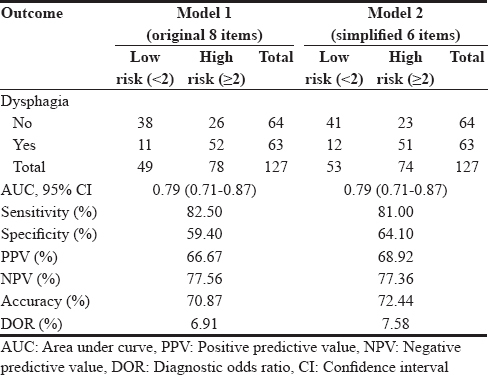 Finally, the sensitivity, specificity, positive predictive value (PPV), negative predictive value (NPV), and accuracy indices were used to compare the predictive effects of the original and simplified versions of the SSA. A P < 0.05 was considered statistically significant. All analyses were conducted using SPSS version 22.0 (SPSS Inc., Chicago, IL, USA). In this study, 127 patient-paired screenings were completed by nurses and an SLP. The mean age of the patients was 70.66 ± 13.43 years (± SD). There were 88 men and 39 women. In 63 (49.6%) patients, dysphagia was detected on the swallowing screening test used by nurses. However, no significant findings were obtained relative to gender. The groups with dysphagia and without dysphagia differed significantly in the results of the eight items on the modified SSA. [Table 1] presents the patient characteristics. Content validity was determined using the S-CVI from the rating results by four content experts. Each expert used a 5-point scale to rate each item in terms of its relevance to the underlying construct. The S-CVI was 0.958. The internal consistency coefficient obtained was acceptable. KR-20 coefficients of 0.719 and 0.862 were obtained for dimension 1 (Q1–Q5) and dimension 2 (Q6–Q8), respectively, indicating that the items were sufficiently homogeneous. 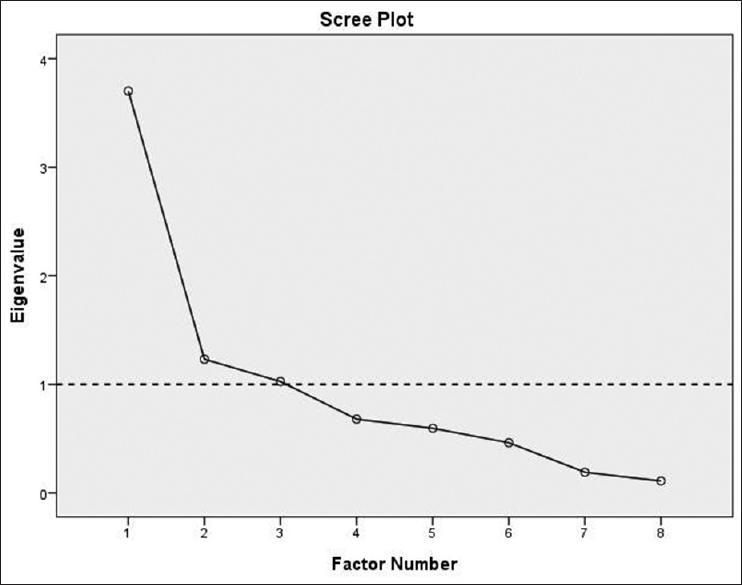 On a convenience sample of nine patients given a repeat modified SSA screening by a different nurse from the first screening, the Kappa coefficient for the overall outcome of pass versus fail was 0.509. The results revealed moderate IRR. The Kaiser–Meyer–Olkin score was 0.713, indicating a sufficient sample size for the number of items in the screening instrument. The Bartlett's test of sphericity was significant (P < 0.001), indicating that a factor analysis may be useful with the research data. All items had a communality loading of >0.5, and three major factors identified in the analysis accounted for 74.52% of the response variance [Figure 1]. The rotated factor matrix [Table 2] showed that Q5–Q8 contributed significantly to Factor 1, and Q1 and Q3 contributed to Factor 2. In addition, Q4 (breathing freely) was the sole contributor to Factor 3. However, Q4 was the only item for Factor 3, and Q2 could not be specifically categorized into any factor. Therefore, Q2 and Q4 were deleted. Another factor analysis was conducted on the remaining six items (i.e., Q1, Q3, Q5, Q6, Q7, and Q8) for Factors 1 and 2. The factors accounted for 73.89% of the response variance, similar to that in the 8-item screening instrument. This result is in accordance with the principle of model simplification (i.e., fewer factors that yield a relatively large amount of explained variance). The original 8-item swallowing screening instrument could be simplified into a 6-item instrument. [Table 3] presents the discrimination ability of two modified SSAs in dysphagia detection. ROC analyses comparing the scores of the screening protocols for dysphagia detection were completed for each nurse and the SLP. The optimal cutoff point on the modified SSA for dysphagia detection was ≥2 of the eight possible points. The area under the ROC curve was 0.79 (95% confidence interval [CI]: 0.71–0.87) for the original 8-item and simplified 6-item scales, which was considered acceptable discrimination. Using the optimal cutoff point identified from the ROC analyses, the sensitivity and specificity of the modified SSA for dysphagia detection were satisfactory according to the results obtained from the original 8-item and simplified 6-item scales (sensitivity levels = 82.50% and 81.00% and specificity levels = 59.40% and 64.10%, respectively). Similarly, the PPV and NPV were acceptable for the results obtained from nurses (PPVs = 66.67% and 68.92% and NPVs = 77.56% and 77.36%, respectively). The resultant diagnostic odds ratio (DOR; original 8-item scale DOR: 6.91; simplified 6-item scale DOR: 7.58) indicated moderate evidence for dysphagia detection. In addition, we adopted Kappa coefficient to evaluate the level of agreement between each modified SSA and SLP evaluation. The Kappa coefficients of original 8-item SSA and simplified 6-item SSA were 0.42 and 0.45 respectively. Both of them indicated moderate agreement. Thus, the simplified 6-item scale worked as well as the original 8-item scale. 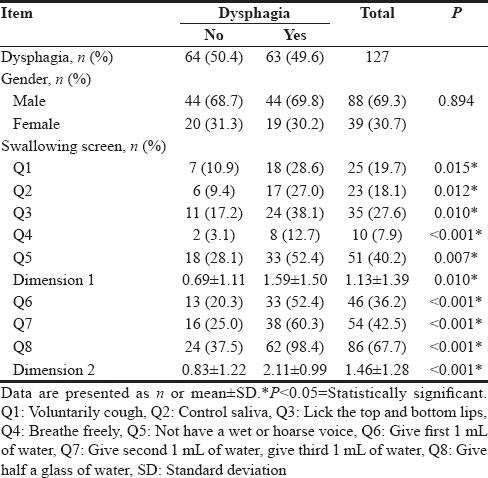 This study was conducted to develop and preliminarily evaluate the Chinese version of a modified SSA instrument used by nurses to identify dysphagia in patients with acute stroke. Half of the patients in our study population had dysphagia, indicating the necessity for a bedside screening instrument for swallowing dysfunction to avoid potential complications. Note that the aim of the screening was not to negate the SLP's formal swallowing assessment but to enable early detection of swallowing difficulties before any additional oral intake, thereby protecting patients from potential additional unrecognized aspiration. Ideally, a good dysphagia screening instrument has both satisfactory sensitivity and specificity. This study provides preliminarily evidence of the instrument's sensitivity (81.00%–82.50%) and specificity (59.40%–64.10%). Furthermore, the Chinese version of the modified SSA demonstrates sustainable PPV and NPV results. Sensitivity and specificity are the intrinsic properties of identifying tests, independent of disease prevalence. By contrast, the PPV and NPV depend on disease prevalence and indicate the probability of disease development following the test, helping clinicians to determine patient management and treatment strategies according to diagnostic test results. In addition, the Chinese version of the modified SSA demonstrates acceptable internal consistency and IRR across nurse raters, and it is easy to use for bedside screening. To increase consistency between nursing staff, each nurse will be allowed to start assessing patients after training in swallowing screening and passing a test given by a preceptor. In addition, every Wednesday morning in the unit meeting, the head nurse will discuss one actual case from the previous week with the ward nursing staff to form a consensus on screening process details. 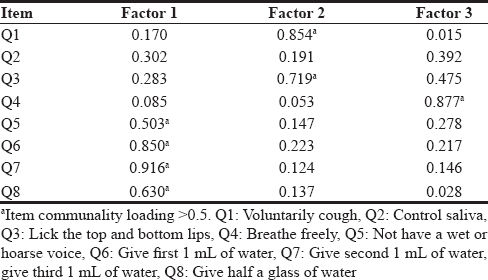 Among the five oromotor examinations (Q1–Q5) and the water-swallowing test (Q6–Q8), only voice change (Q5) and the water-swallowing test (Q6–Q8) belonged to the same factor group, indicating that voice change has a close relationship to the water-swallowing test. Voluntary coughing (Q1) and licking of the top and bottom lips (Q3) formed one factor group, indicating that both examinations reflect oral–pharyngeal phase abnormalities in dysphagia. In oromotor examinations, the factor loading of saliva control (Q2) was less than 0.5. The saliva control variable could be omitted because it was not a contributing factor. Breathing freely (Q4) was identified as an independent factor; however, it was removed because it involved only one item. Perry explored the relative contributions of component variables in the SSA. This study suggested that the SSA instrument can be reduced to three variables for dimension 1 without significant loss of accuracy, thus providing clinical utility with a shorter screening time. In our study, the factor analysis results revealed that the number of screening variables could be reduced from eight to six. Previous systematic reviews, have shown that the water-swallowing test is a useful screening instrument for the detection of aspiration in patients with stroke. The other study recommended modified 30 mL water-swallowing test as a useful single task-screening tool to detect aspiration. In a systematic review by Chen et al., 3 mL to 3 oz of water was used in swallowing tests. Although we used 75 mL, a relatively different amount, the sensitivity for dysphagia detection was as good as that in Chen et al. Chen et al. indicated that increasing the water volume resulted in higher sensitivity but lower specificity in the swallowing test. We modified the usual water swallowing test protocols; water loading was repeated four times (1 mL of water three times and then gradually increasing volumes ranging from 1 to 10 mL followed by 75 mL of water), which helped improve the safety and accuracy of the test. Rofes et al. recommended different volumes (5, 10, and 20 mL) and viscosity levels (nectar-like, thin liquid, extreme spoon-thick) for bedside clinical assessment of swallowing function in high-risk populations such as elderly patients, nursing home residents, and patients with neurological diseases. Clinical screening alone might be insufficient for identifying patients at risk of aspiration pneumonia. Aspiration can lead to life-threatening complications. Further attention is required to reduce the false negative rate. In our study, the stroke patient's swallowing ability was screened by a nurse and was then assessed by an SLP. Ellis and Hannibal reported that many swallowing screening instruments identified in the literature evaluate only water and were not designed to recognize individuals experiencing difficulties in swallowing solids. Therefore, reevaluation would be required using the modified SSA and patients must be closely monitored for signs and symptoms of aspiration pneumonia, including abrupt onset of dyspnea, fever, and diffusive crackles on lung auscultation. To assess the performance of new tests, they must be compared with a gold standard reference whose accuracy is known to be within clearly defined limits. Accordingly, we assessed the accuracy of the modified SSA used by nurses against the SLP's evaluation. Although the FEES and VFSS have been proposed as the gold standard in validity testing for swallowing,, they were not used as a reference in our study because they are not universally accepted due to requirements for skilled operators and specialized equipment. To successfully integrate dysphasia screening into daily care routines, a dysphasia screening instrument should be simple to use and interpret without requiring invasive techniques or equipment. In addition, SLP evaluations are typically used to assess swallowing capabilities at this institution; therefore, our comparison most closely reflects clinical practice. The Chinese version of the modified SSA is advantageous because it is simple to use, safe, and developed for use by nurses; moreover, it does not require lengthy or complicated training for nurses. In addition, a comparison of the modified SSA with previously established nurse-administered screening instruments revealed that the modified SSA demonstrates superior accuracy in dysphagia detection. A patient's swallowing capacity may change between evaluations by the nurse and SLP because an SLP cannot be present in the stroke unit every time a swallowing screening is performed by nurses. We attempted to minimize this possibility by having the SLP to perform evaluations within 2 days after the nurses' screenings because diagnosis and management of dysphagia should be done as soon as possible by an SLP. Extraneous variables affecting results included spontaneous resolution of stroke symptoms or declining neurological status. Therefore, changes in swallowing capabilities between evaluations probably decreased the validity. Because of the satisfactory sensitivity but poor specificity of the scale, we screen stroke patients more than once. Patients are screened when they are first hospitalized and then every week to overcome this shortcoming. Patients with vocal fold paralysis can suffer from sensory deficits such as absent cough and delayed swallow response, heightening the risk of silent aspiration. Splaingard et al. observed that 40% of their subjects who aspirated on VFSS were not identified as having aspirated on a bedside examination. The clinician must select those examinations believed to be most appropriate for that patient's anatomy and swallow physiology with neurologic dysfunction. The Chinese version of the modified SSA instrument is inexpensive, easy to use, and sensitive; it satisfies the requirements of an oropharyngeal dysphagia screening test in patients with acute stroke. The present study provides an analogous predictive result for the simplified 6-item and original 8-item SSA scales and serves as empirical evidence in the revision of the current dysphagia screening procedure. This work was supported by a grant from Buddhist Tzu Chi General Hospital (TCRD105-56), Hualien, Taiwan. Martino R, Silver F, Teasell R, Bayley M, Nicholson G, Streiner DL, et al. The Toronto bedside swallowing screening test (TOR-BSST): Development and validation of a dysphagia screening tool for patients with stroke. Stroke 2009;40:555-61. Jauch EC, Saver JL, Adams HP Jr., Bruno A, Connors JJ, Demaerschalk BM, et al. Guidelines for the early management of patients with acute ischemic stroke: A guideline for healthcare professionals from the American Heart Association/American Stroke Association. Stroke 2013;44:870-947. Courtney BA, Flier LA. RN dysphagia screening, a stepwise approach. J Neurosci Nurs 2009;41:28-38. Bours GJ, Speyer R, Lemmens J, Limburg M, de Wit R. Bedside screening tests vs. Videofluoroscopy or fibreoptic endoscopic evaluation of swallowing to detect dysphagia in patients with neurological disorders: Systematic review. J Adv Nurs 2009;65:477-93. Sørensen RT, Rasmussen RS, Overgaard K, Lerche A, Johansen AM, Lindhardt T, et al. Dysphagia screening and intensified oral hygiene reduce pneumonia after stroke. J Neurosci Nurs 2013;45:139-46. Cecconi E, Di Piero V. Dysphagia – Pathophysiology, diagnosis and treatment. Front Neurol Neurosci 2012;30:86-9. Hinchey JA, Shephard T, Furie K, Smith D, Wang D, Tonn S, et al. Formal dysphagia screening protocols prevent pneumonia. Stroke 2005;36:1972-6. The Joint Commission on Accreditation of Healthcare Organizations. Disease-specific care stroke performance measurement implementation guide. 2nd ed. Illinois: The Joint Commission; 2008, p. 3-4. Hines S, Wallace K, Crowe L, Finlayson K, Chang A, Pattie M, et al. Identification and nursing management of dysphagia in individuals with acute neurological impairment (update). Int J Evid Based Healthc 2011;9:148-50. Travers PL. Poststroke dysphagia: Implications for nurses. Rehabil Nurs 1999;24:69-73. Ramsey DJ, Smithard DG, Kalra L. Early assessments of dysphagia and aspiration risk in acute stroke patients. Stroke 2003;34:1252-7. Jaeschke R, Guyatt G, Sackett DL. Users' guides to the medical literature. III. How to use an article about a diagnostic test. A. Are the results of the study valid? Evidence-based medicine working group. JAMA 1994;271:389-91. Perry L. Screening swallowing function of patients with acute stroke. Part one: Identification, implementation and initial evaluation of a screening tool for use by nurses. J Clin Nurs 2001;10:463-73. Massey R, Jedlicka D. The Massey bedside swallowing screen. J Neurosci Nurs 2002;34:252-3, 257-60. Edmiaston J, Connor LT, Loehr L, Nassief A. Validation of a dysphagia screening tool in acute stroke patients. Am J Crit Care 2010;19:357-64. Warner HL, Suiter DM, Nystrom KV, Poskus K, Leder SB. Comparing accuracy of the Yale swallow protocol when administered by registered nurses and speech-language pathologists. J Clin Nurs 2014;23:1908-15. Cummings J, Soomans D, O'Laughlin J, Snapp V, Jodoin A, Proco H, et al. Sensitivity and specificity of a nurse dysphagia screen in stroke patients. Medsurg Nurs 2015;24:219-22, 263. Weinhardt J, Hazelett S, Barrett D, Lada R, Enos T, Keleman R, et al. Accuracy of a bedside dysphagia screening: A comparison of registered nurses and speech therapists. Rehabil Nurs 2008;33:247-52. Bravata DM, Daggett VS, Woodward-Hagg H, Damush T, Plue L, Russell S, et al. Comparison of two approaches to screen for dysphagia among acute ischemic stroke patients: Nursing admission screening tool versus national institutes of health stroke scale. J Rehabil Res Dev 2009;46:1127-34. Park YH, Han HR, Oh S, Chang H. Validation of the Korean version of the standardized swallowing assessment among nursing home residents. J Gerontol Nurs 2014;40:26-35. Perry L. Screening swallowing function of patients with acute stroke. Part two: Detailed evaluation of the tool used by nurses. J Clin Nurs 2001;10:474-81. Donovan NJ, Daniels SK, Edmiaston J, Weinhardt J, Summers D, Mitchell PH, et al. Dysphagia screening: State of the art: Invitational conference proceeding from the state-of-the-art nursing symposium, international stroke conference 2012. Stroke 2013;44:e24-31. Trapl M, Enderle P, Nowotny M, Teuschl Y, Matz K, Dachenhausen A, et al. Dysphagia bedside screening for acute-stroke patients: The Gugging swallowing screen. Stroke 2007;38:2948-52. Tippett DC. Clinical challenges in the evaluation and treatment of individuals with poststroke dysphagia. Top Stroke Rehabil 2011;18:120-33. Rofes L, Arreola V, Mukherjee R, Clavé P. Sensitivity and specificity of the eating assessment tool and the volume-viscosity swallow test for clinical evaluation of oropharyngeal dysphagia. Neurogastroenterol Motil 2014;26:1256-65. Daniels SK, Anderson JA, Willson PC. Valid items for screening dysphagia risk in patients with stroke: A systematic review. Stroke 2012;43:892-7. Chen PC, Chuang CH, Leong CP, Guo SE, Hsin YJ. Systematic review and meta-analysis of the diagnostic accuracy of the water swallow test for screening aspiration in stroke patients. J Adv Nurs 2016;72:2575-86. Nishiwaki K, Tsuji T, Liu M, Hase K, Tanaka N, Fujiwara T. Identification of a simple screening tool for dysphagia in patients with stroke using factor analysis of multiple dysphagia variables. J Rehabil Med 2005;37:247-51. Lindner-Pfleghar B, Neugebauer H, Stösser S, Kassubek J, Ludolph A, Dziewas R, et al. Management of dysphagia in acute stroke: A prospective study for validation of current recommendations. Nervenarzt 2017;88:173-9. Ellis AL, Hannibal RR. Nursing swallow screens: Why is testing water only not enough? J Neurosci Nurs 2013;45:244-53. Guillén-Solà A, Marco E, Martínez-Orfila J, Donaire Mejías MF, Depolo Passalacqua M, Duarte E, et al. Usefulness of the volume-viscosity swallow test for screening dysphagia in subacute stroke patients in rehabilitation income. NeuroRehabilitation 2013;33:631-8. Smith Hammond CA, Goldstein LB, Horner RD, Ying J, Gray L, Gonzalez-Rothi L, et al. Predicting aspiration in patients with ischemic stroke: Comparison of clinical signs and aerodynamic measures of voluntary cough. Chest 2009;135:769-77. Antonios N, Carnaby-Mann G, Crary M, Miller L, Hubbard H, Hood K, et al. Analysis of a physician tool for evaluating dysphagia on an inpatient stroke unit: The modified Mann assessment of swallowing ability. J Stroke Cerebrovasc Dis 2010;19:49-57. Jiang JL, Fu SY, Wang WH, Ma YC. Validity and reliability of swallowing screening instruments used by nurses for dysphagia: A systematic review. Tzu Chi Med J 2016;28:41-8. Splaingard ML, Hutchins B, Sulton LD, Chaudhuri G. Aspiration in rehabilitation patients: Videofluoroscopy vs. bedside clinical assessment. Arch Phys Med Rehabil 1988;69:637-40.